Desert streams occupy arid and semiarid regions defined by low annual precipitation. Semiarid and arid climate zones are found on all continents and include both hot and cold deserts. Although the range of temperatures varies across desert regions, summer temperatures may exceed 40 °C in hot deserts. Annual precipitation ranges from <100 to 300mmyr_1 and combined with high temperature can result in high rates of evapotranspiration. Higher precipitation in the mountains (up to ^1000 mm yr_1) can feed streamflow in the low deserts, often supporting perennial flows in large basins. Arid and semiarid regions are characterized by distinct seasons defined by precipitation and/or snowmelt and the amount of precipitation that falls during these seasons shows high interannual variability. This results in extreme seasonal and interannual variation in stream discharge. Indeed, streams in some desert regions flow in response to rain events that occur only once in several years or even less. Arid and semiarid lands account for over one-third of global lands, making desert streams prominent among aquatic ecosystems. The large geographic area covered by deserts results in a wide variation in temperature and precipitation regimes as well as in geomorphology. Thus, the hydrogeomorphic templates and resulting ecological characteristics of desert streams exhibit a great diversity of patterns. Despite this extensive distribution of desert streams, the vast majority of ecological studies of desert streams have occurred in the southwestern United States, Australia, and Antarctica. 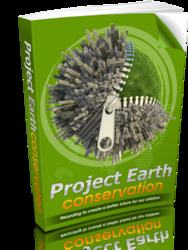 Our discussion thus draws from results of studies in these ecosystems. Future studies of desert stream ecosystems in other regions are likely to add new dimensions to the state of our understanding presented here. 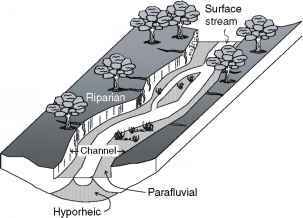 Figure 1 Schematic drawing of a desert stream-riparian corridor. groundwater there before discharging into the surface stream. These contrasting hydrologic templates can have significant effects on nutrient dynamics, water storage, and biota within stream-riparian corridors. Losing reaches, for example, often have no surface flow during dry seasons, whereas gaining reaches are a more permanent source of surface water. Due to permeable sediments, interactions between surface and subsurface water are dynamic. For example, water moves into the hyporheic zone in regions of downwelling and from the hyporheic zone to the surface in regions of upwelling. Water within the hyporheic zone moves through the interstitial spaces of sediments slowing water velocity compared to the surface stream. Such patterns in hydrologic flows have important implications for nutrient cycling and stream productivity. may remove riparian vegetation. These effects vary depending on the scale of the event (see the section titled 'Temporal dynamics'). The boundaries of a stream ecosystem in any climate region extend beyond the wetted channel and comprise a stream-riparian corridor (Figure 1). The aquatic ecosystem encompasses surface water as well as the alluvial sediments beneath the streambed where surface and groundwater mix, termed the hyporheic zone. The para-fluvial zone is defined by the region of the active channel over which water flows only during floods and in desert streams this region can be much wider than the stream itself. Finally, the riparian zone is the land area surrounding the stream that is significantly influenced by the stream. The availability of water contrasts starkly among these subsystems in desert streams making each subsystem more distinct than in mesic streams. In deserts, the hyporheic zone often contains water and sustains biological activity in the subsurface even in the absence of surface flow. The parafluvial zone contains surface water only during floods and flow quickly recharges the subsurface through coarse sediments or gravel in this zone, leading to short periods of surface flow but sustained subsurface flow. The riparian zone contrasts starkly with desert uplands owing to the presence of shallow groundwater that is accessible to plants.